I get "HAX is not working and emulator runs in emulation mode", is this related to Intel x86 Emulator Accelerator (HAXM) installation and running avd with cpu set to CPU Intel Atom (x86)? And even though it feels like AVD runs faster after i installed HAXM, does this message indicates that AVD performance is hindered. Should it be fixed and if so, how? I am running on mac os x 10.9.1. Intel x86 Emulator Accelerator (HAXM) AND I ALSO run dmg installer as well, and installed hot fix, after i found out about it. emulator: The memory needed by this VM exceeds the driver limit. Yes it should be fixed, HAXM isn't working. How much RAM is set for use inside your AVD configuration ? 768M is a good number for it, but most importantly this number has to be lower or equal to the memory usage you have set during the installation of HAXM. You can launch its installation again to modify it. 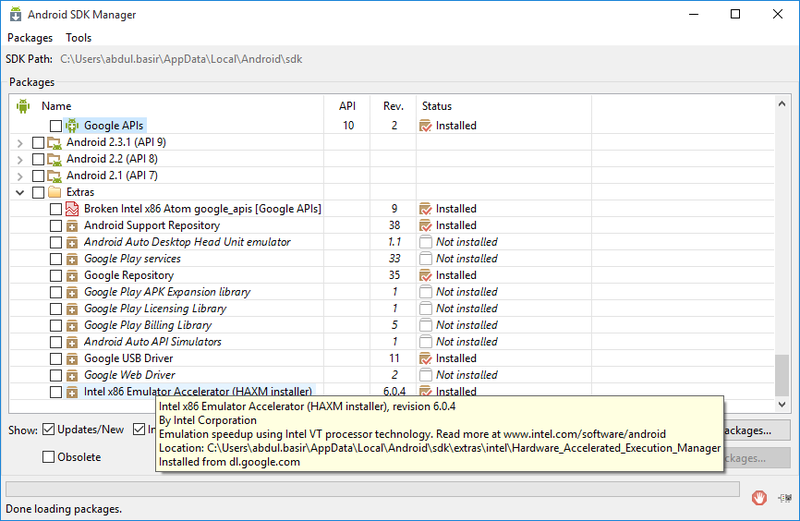 If you are using Android Studio then you can achieve the same result from the menu Tools ➞ SDK Manager, and then on the SDK Tools tab, select the checkbox for Intel x86 Emulator Accelerator (HAXM installer), and click Ok. The way I solved it is by setting the AVD memory limit and HAXM memory to be equal in size which is 1 GB = 1024 MB. The AVD cannot have higher memory limit than the HAXM. The only way to change the HAXM memory is by installing it again. I did it using the terminal. Locate Hardware_Accelerated_Execution_Manager in your machine. Then change directory that folder to run the installation script. sudo chmod 755 "HAXM installation"
This works for me. Good luck! Tools > Android > AVD Manager > Your Device > Pencil Icon> Show Advanced Settings > Memory and Storage > RAM > Set RAM to your preferred size. 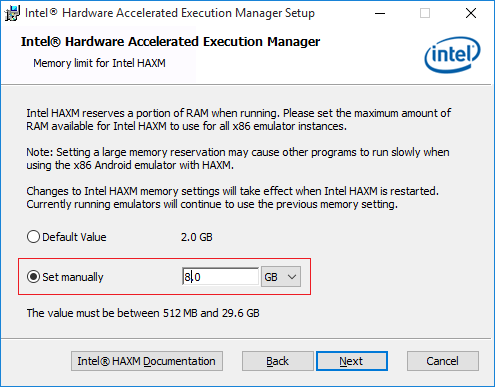 Programs and Features > Intel Hardware Accelerated Execution Manager > Change > Set manually > Set RAM to your preferred size. It is better for RAM sizes set in both places to be the same. Check the latest version of Has on Intel website and install it. Let the ram in recommended size "preset 2048", then try to run the app. Things should work fine. Yes it should be fixed, HAXM isn't working. HAXM sometimes works; experience with HAXM is currently sporadic across platforms. For instance, I've got late 2009 iMac running 10.8.5 and i7 processor @2.8Ghz, Android SDK 22.6 with all the goodies updated this morning (03/05/14). API17 will build emulators with HAXM acceleration on this iMac machine, API19 chokes out. I also have early 2013 MBP 15" Retina running 10.8.5 and i7 processor @2.7Ghz, Android SDK 22.6 with all the goodies updated this morning (03/05/14). API17 will build emulators with HAXM acceleration, API19 works great too. Ditto for my (personal) late 2013 MBP Retina 13" with dual-core i5 and Mavericks. There is something going on for virtualization at the chip level missing from older CPU's (even i7's) that the new API19 x86 images need for HAXM to work. If API19 is not working, give API17 or even 16 a try. also check the ram size allocated while doing HAX installation so it fits the ram size of your emulator. This video shows all the required steps which may help you to solve the problem. This video will also help you if you face problem after installing HAXM. You have to verify than the size allocated while doing HAX installation is the same than the size in the AVD emulator configuration. geckob's solution works perfectly. Caution: The HAXM that you provide is used across all running devices. So if you are testing on a phone and Tablet at the same time and each has a requirement of 1G. Then make sure your HAXM alloted is atleast 2G. 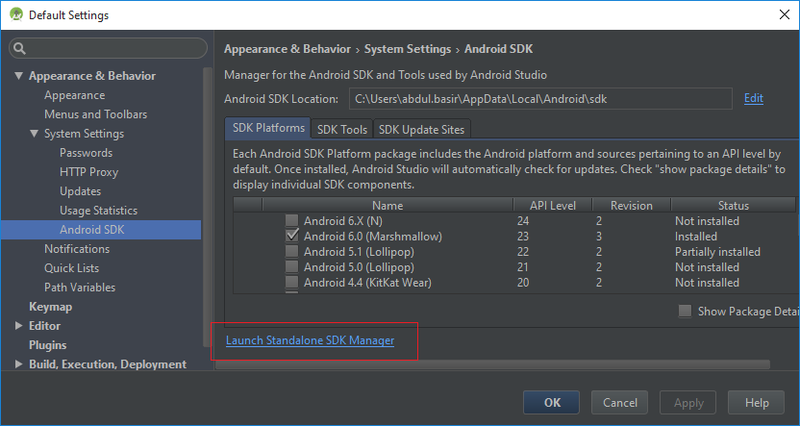 Open your SDK Manager from Android Studio, click the icon shown in the screen shot. Click on "Launch Standalone SDK Manager" on the "Default Settings" Dialog. Check node "Extras > Intel x86 Emulator Accelerator (HAXM installer)" and proceed with HAXM download. You can now access with installation (or modifying existing installtino) of HAXM by accessing the download location. Enter this path in "run"
and double click the file "intelhaxm-android.exe"
You can increase the size of memory allocated to HAXM while modifying existing HAXM install. I have a machine with 32 GB of RAM and would like to launch multiple AVDs at same time (for automated testing etc.) so I have allocated 8 GB to HAXM. If you are running one AVD of one 1 GB and allocated 2 GB to HAXM, you cannot run another AVD with RAM more than 1 GB. Please make sure that Android Device Monitor is not running when you are modifying or installing HAXM (just to avoid any suprises). These steps are tested on Windows platform, but generally could be applied to other platforms too with slight modification. Force the process to quit using the 'x' button in the top left. I didn't have to use 'Force Quit', just the plain 'Quit', but you can use either. Upto this point the error should be fixed. Now I'm listing my specific environment in case it could be of some help for someone using OS X.
MacBook (13-inch), 2 GHz Intel Core 2 Duo, 4 GB Ram. Marshmallow (23) x86 didn't pass the flashing Android icon screen for even hours. Starting Android (Finishing boot) and remained stuck here for hours. KitKat (19) x86 worked successfully and I could install the hello world there. 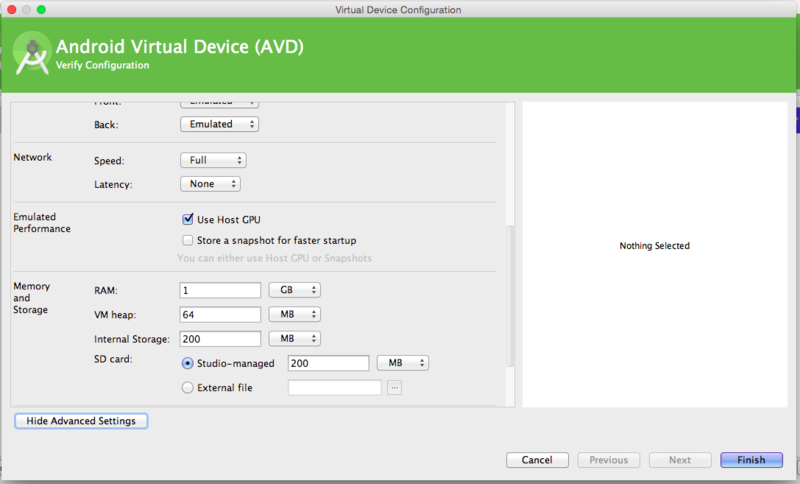 Re-open your AVD device configuration. by editing device in the AVD manager. 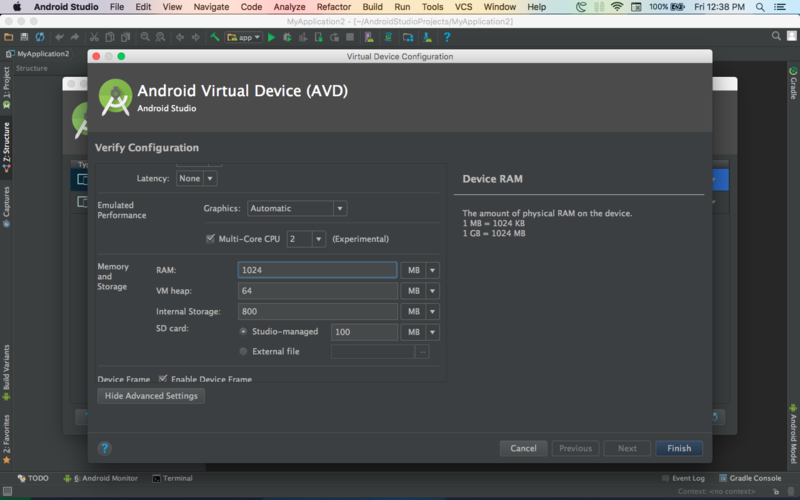 proceed to select the AVD Android version. At the right pane a recommendation is displayed follow that recommendation and all will be fixed. Default memory assigned to HAX is 1024MB. And the emulator has 1536MB apparently for Nexus 5x api 25.
just go to tools -> AVD manager. Then select the emulator and click on pencil button on the right for editing. Not the answer you're looking for? Browse other questions tagged android macos android-emulator or ask your own question. Why is the android emulator starting but then dying immediately?